If you make your own soap, then you've probably come across lye, a corrosive alkaline substance crucial to the soap making process. Lye can be dangerous when not handled properly, which is why some people prefer methods of soap making that do not require direct handling of the substance. Skip the risky caustic chemicals and make your soap from already-made bars or gentle ingredients. You can turn out beautiful healing and herbal soaps that look and smell divine, often with supplies from your own kitchen or garden. This melt-and-pour soap recipe allows you to customize the scent and herbal qualities of the finished bar. Pour water over your herbs in a small pan. Add five or six drops of essential oil. Pour mixture over the shredded Ivory soap in the mixing bowl. Divide the mixture into several small balls or press into the selected soap making mold. Let dry for one or two days on a glass plate in a cool area of your home. You get about four 4 oz. bars of soap from this mix -- more if you use a mold for small fancy soaps for gifts or for the guest bathroom. Glycerin gives you translucent, beautiful soap you can tint in the most delicate colors. The bars can showcase a sprig of herb or flower captured inside. 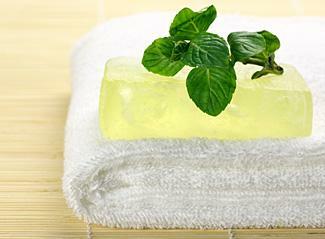 Try green tea, rose, mint, or lemon verbena notes for clear, delicate soap. Glycerin helps to moisturize your skin, so that attractive bar of soap will make you more attractive, too -- win/win. Cut the glycerin into chunks. In the top of the double boiler, melt the glycerin until it is a liquid. 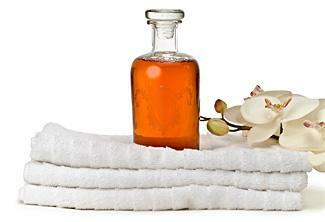 Don't stir too much or too vigorously, because you don't want air bubbles in your soap. Stir in herbs and other additives if desired. Pour the soap mixture into the mold that you have chosen. Allow it to cool for one to two hours. Remove your soap from the mold; it's ready to use. One pound of glycerin makes about four 4 oz. bars of soap. Once you get used to making soap, you can experiment with a variety of different additives and mold shapes. You can easily use small chocolate molds to make unique gift soaps and add a variety of items to bar soap to make it interesting. You may want to try a beeswax soap when using this process. Another way to make soap without lye is to use plants that are high in saponin, a soapy substance. These have been used since ancient times to clean clothes, bodies, and homes. In the history of soap making, plants have been used much longer than other soap products. Place the soapwort and water in the pan. Bring to a simmer, stirring gently, until suds form -- about half an hour. Add a few drops of lavender oil to help give it antibacterial properties. Experiment with the oil to infuse your soap with scent. Start with about 10 to 12 drops and add more just until you are satisfied. The scent will not evaporate in the liquid the way it does in hard soap. You will need to use it up in no more than a week, so make it in small batches. The soapy liquid can be used for shampoo, laundry, or in soap dispensers for washing hands. It is mild and gentle. This "recipe" makes about four 8 oz. bottles of liquid soap. All soaps, both handmade and commercially prepared, are made when a chemical reaction occurs as lye reacts to fat. Even liquid soaps and shower gels are made with a form of lye called potassium hydroxide or "caustic potash." The term saponification is used by soap makers to describe the process by which lye interacts with the other ingredients in your soap to create the finished product. Direct work with lye in soap making calls for extreme caution -- excellent ventilation, a breathing mask, gloves and eye protectors, an apron to catch splashes, completely separate utensils. You may not want to deal with all of that if you have pets and young children around the house or work area. Even though it is possible make soap without lye in its raw state, you should still invest in an apron, eye protection, and gloves. 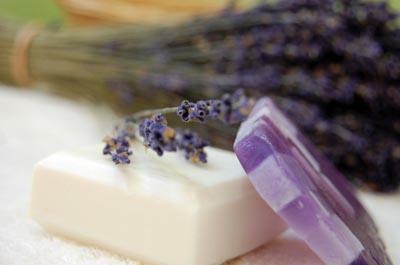 The essential oils used to fragrance this type of handmade soap may smell heavenly, but they are irritants if they come into contact with your skin at full strength. As a soap maker, staying safe should always be your top priority. Find all the safety equipment you need at your local hardware or big box store or from online soap making suppliers. Split the initial investment with crafty friends by buying safety supplies wholesale. Making your own soap is at once frugal, fancy, and fun. You save money when you assemble the raw ingredients and add your own special touches and favorite fragrances. Homemade soaps make terrific holiday, or anytime, gifts. And, if you really get hooked on the creative process, you can package and sell your pretty custom soaps at fairs or green markets. Now it's a bargain hobby that pays for itself as it keeps you sweet-smelling and clean.